Wireless networks rely on radio frequencies to communicate. Radio frequencies create electromagnetic (EM) fields, which become the medium to transfer signals from one computer to another. Wireless networks are also prone to malicious attacks if they are not properly secured. This tutorial covers a brief discussion of different mechanisms that can be used to protect computers using wireless networking. Frequency-hopping spread spectrum (FHSS) This is the method of transmitting RF signals by rapidly switching frequencies according to a pseudorandom pattern, which is known to both the sender and the receiver. FHSS uses a large range of frequency (83.5 MHz) and is highly resistant to noise and interference. Direct-sequence spread spectrum (DSSS) This is a modulation technique used by wireless networks that uses a wide band of frequency. It divides the signal into smaller parts and transmits them simultaneously on as many frequencies as possible. DSSS is faster than FHSS and ensures data protection. It utilizes a frequency range of 2.4 GHz to 2.4835 GHz and is used in 802.11b networks. The most popular of the IEEE 802.11 wireless network standards are 802.11b, 802.11a, 802.11g, and 802.11n. Security standards for these protocols are defined in the 802.11i standard. This is actually not authentication. Every computer trying to connect to a wireless network is granted a connection. This method requires that every wireless client knows the shared secret key. The access point and all wireless clients must use the same shared secret key. The IEEE 802.11X standard defines how to provide authentication for devices trying to connect with other devices on LANs or wireless LANs. This method requires use of advanced encryption and authentication techniques to provide strong authentication. This method can be used for smaller home or office networks that cannot implement the IEEE 802.1x authentication mechanisms. The preshared key consists of a 20-character-long paraphrase containing upper- and lowercase letters and numbers. Wi-Fi Protected Access Pre-Shared Key (WPA-PSK) is a security mechanism used to authenticate and validate users on a wireless LAN (WLAN) or Wi-Fi connection. It is a variation of the WPA security protocol. WPA-PSK is also known as WPA2-PSK or WPA Personal. WPA-PSK works by configuring a WLAN passphrase or password of eight to 63 characters. Based on the password, access point (router) and connecting node credentials, a 256-character key is generated, shared and used by both devices for network traffic encryption and decryption. 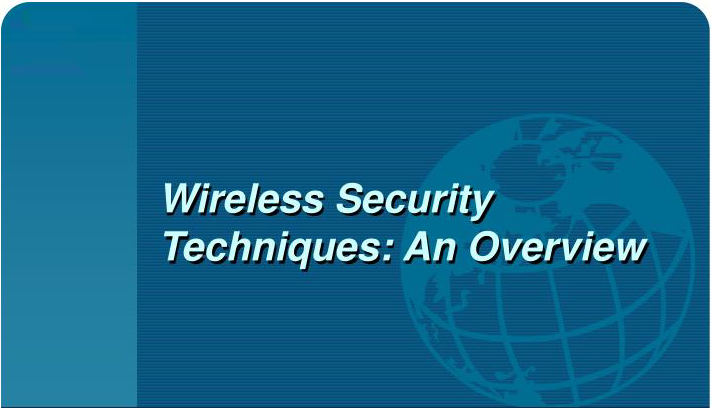 Wireless Transport Layer Security (WTLS). WTLS is designed to provide end-to-end security for WAP devices. WTLS is based on the Transport Layer Security (TLS) protocol that is a further derivative of Secure Socket Layer (SSL). WTLS is designed to provide privacy and availability for both the WAP server and the WAP client. WTLS works for applications that run on devices with lowprocessing capabilities, low bandwidth, and limited memory. WTLS uses a compressed certificate format following the X.509v3 standard but defines a smaller data structure.